Charming cottage nestled in oak trees and amazing views of Aransas bay! Rock N Reel Fish You Were Here! 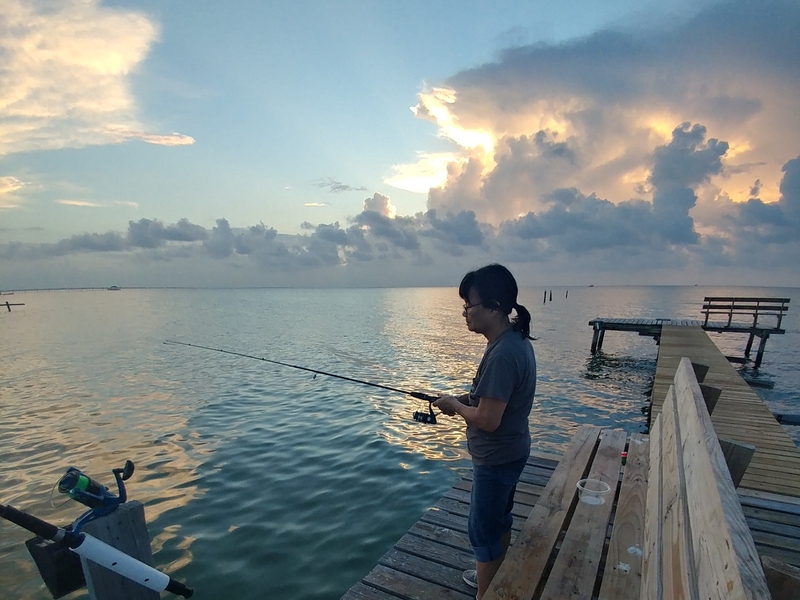 Caprice Cottage is a charming retreat nestled in oak trees along Fulton Beach Road in the Sun Harbor Cottage community with a beautiful view of Aransas Bay right out the front door. This little gem has plenty of room for your friends and family to gather with an open concept floor plan and space for everyone. 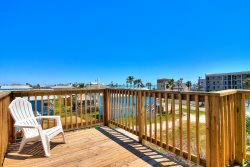 The living room and dining room have comfy furniture and large windows that offer the most amazing views of Aransas Bay. If you have not witnessed a Rockport sunrise you are truly missing out! The master bedroom has a king size bed. Rest peacefully after a long day of taking in all that Rockport has to offer. The second bedroom has two twin beds and a sleeper sofa in the living room. Caprice Cottage will sleep 6 people and is also pet friendly! There are two bathrooms in cottage. The master bathroom has recently been remodeled with a large walk in shower. There is even a washer and dryer at the cottage for guest to use. Step right outside the door and enjoy the view. Caprice Cottage is located on Fulton Beach Road and the perfect area to take a walk or bike ride along the bay. Nothing cures the soul better than some salty air! Take a dip in the swimming pool on site overlooking the bay that is open to guest and residents at the Sun Harbor Cottages. We do offer cable television and internet. There are 3 cable TV's in the unit. The pier has been repaired and a new fence put around the pool. There are many perks available to guests that stay at Caprice Cottage. Check out the amenities list below! Caprice Cottage is the perfect place to get away from it all. We hope to see you soon! 164 ft. fishing pier - no lights at this time. The team is always friendly. Helpful amd accommodates specisl needs. Confort begins when I unpack my suitcase and put my feet up on the patio. Enjoy working in the kitchen and on the patio, as well. It wasn't necessary for us to have to work with your team since no issues arose. When I did email, there was a very quick response. This little vacation was just what we needed. Caprice Cottage was amazing! The whole reservation process was simple. The house had everything we needed from kitchen utensils to card games for rainy days. Loved the walk-in showers and the beds were comfortable. Plenty of seating for the family to sit around visiting inside and outside. We really enjoyed fishing off the pier and using the pool. Mornings and evenings were perfect times to sit out, drink our coffee and enjoy the view of the water. Picking a favorite feature is hard. I would say the showers, the view of the water and the open layout. And the pool!